You do not need to come to us for your driving lesson. Instead, our instructor go to your place giving you a driving lesson on the appointment date for your convenience. We do not cut students lesson time to pick and drop off another student on their lesson time. Our students are deserved full attention from their instructor without sharing any lesson time with another student. The training consists of 2 hours lesson/day. No vehicle usage fee, no gasoline fee, no hazard insurance fee, no pick up and drop off fees. All the cost is inclusive in the price. Just simply honest service! Our instructors are back ground checked (DOJ) and licensed by DMV in teaching driver education and driver training course. Learn to Drive Safely and Quickly! All prices subject to change without any notifications! WE OFFER: Free pick up and return,Private Lesson,Insured Training Vehicle,Insured Workman Comp,DMV licensed driving instructors. Reg:$120.00 You save $10.00 or more! Reg:$240.00 You save $30.00 or more! Reg:$360.00 You save $84.00 or more! Reg:$480.00 You save $112.00 or more! Reg:$600.00 You save $140.00 or more! Reg:$720.00 You save $168.00 or more! Make driving appopintment before 2:00PM on weekdays and activate permit! 4. Right to cancel service at any time and any reason due to unforseen events. Reg:$360.00 You save $90.00 or more! Reg:$480.00 You save $120.00 or more! Reg:$600.00 You save $150.00 or more! Reg:$720.00 You save $180.00 or more! The students make driving appointments on Weekends when the appointments are available except holidays/instructors days off. Activate permit! DMV requires 6hours driver training for teen under 18. The students make appointments any days of week when the appointments are available except holidays/Instructors days off. Depending on student's driving skill, Freeway driving may be included in purchasing of 12hours lesson. Reg:$210.00 You save $0.00 or more! Reg:$330.00 You save $30.00 or more! Reg:$470.00 You save $80.00 or more! Reg:$590.00 You save $100.00 or more! Reg:$710.00 You save $120.00 or more! Reg:$830.00 You save $140.00 or more! An Standard Driving course with DMV driving Test, An instructor takes you to DMV for the driving test. Call us min.5days prior to your test day to schedule. Standard Driver Training Plus Free Online DE. DMV requirements for teens age between 15 1/2 ~ 17 1/2 Driver Ed and Training: This program is combined Online Driver Ed and Standard Driver Training. FREE online Driver Ed for 6hours or more driver training! Our goal is to meet the highest standards of excellence by teaching our students to become defensive drivers. We provide our service throughout L.A. and Orange County area. Over 55,000 students have taken our course since 1997. Private Lesson: Our Behind -The-Wheel-Training lesson is the private lesson. We do not let our students pick up or drop off another students on thier lesson time, nor share the lesson time with other students. The training consists of 2 hours lesson/day. Free Home Pick up and Drop Off: Our students do not need to come to us for registeration and your driving lesson. Just give us call or make appointments online. We send our instructors to your place giving you a driving lesson on the appointment date without any hidden expenses for your convenience. 1. A-Team driving school instructors: Our driving school instructors are licensed by DMV; their background has been checked and screened by the Department of Justice. They are trained to be patient. If a student is not satisfied with the driving instructions provided by an instructor, we may change and switch out the instructors. Driving instructors are employees to our driving school. We have right to cancel service at any time and any reason due to unforseen events. 2. A-team driving school training vehicle: The vehicles are equipped with dual brake to further assist our students in both experience and safety. Vehicles are not equipped with dual steering wheel so students can have more time to experience control over the vehicle and to accelerate students driving skill.Students are covered by liability insurance against other motorist on public highways while driving the training vehicle. 3. 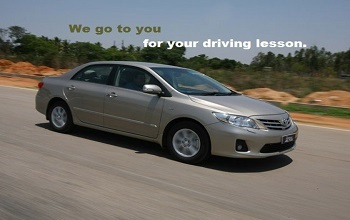 Driving Lesson: It is a completely individualized private lesson that is depending on the level of the driving skills. There are no share time with other students. Our driver training lesson appointments are not made back-to-back so that the next student will not need to be picked up during the driving lesson; therefore, it is imperative to cancel 24 hours ahead. Ateam Driving School charges a penalty fee for same day cancellation. Please call us at least 24 hours ahead (Before 3:30pm) or cancel online 24 hours ahead (before 3:30PM) to avoid penalty. 4. Six hours driver's training completion certificate: For students under the age of 18 years old who have completed the 6 hours driver's traing course will be issued a certificate of completetion of 6 hours behind-the- wheel training by the instructor. This certificate must be presented to the DMV when the student attempts to take the DMV driving exam. Please do not lose the certificate ( There will be $35 for administration fee for reissuance of the certificate). 5. Refund policy: There will be no refunds after 6 months. Courses expire within 1 year. Before the 6 months, we will refund the amount of hours the student did not take.